After a lot of troubleshooting, a rom reinstallation and a couple of workarounds, I can now finally start Tasker tasks, from my Gear 2 Neo, on my Galaxy S3, which in turn can control almost anything on the phone itself, my laptops or other devices! Before this, I was only able to send notifications from Tasker to the Gear 2, which is also cool but controlling your smartphone with your smartwatch gives you endless possibilities! Follow @CarbonWyre's guide first, to get your Android phone to work with the Gear 2. WARNING: I’m not responsible if you brick your phone! Read the guide carefully! Regarding point 1: I can’t really help with this, as I have a Galaxy S3 with a custom rom installed (SlimROM 4.4.4) and I had to follow @CarbonWyre's guide for it, but it should work out of the box and even easier. Just make sure you have Gear Manager installed from the Samsung app store and then go to the steps further below. Regarding point 2: after following @CarbonWyre's guide and connecting your Gear 2 to the phone, you also need to be able to receive notifications and also install apps from the GALAXY Apps store correctly, not only the stand-alone apps but also those that install on the phone too! This usually gave the “Installation Failed. Try Later. (0)“ error, until yesterday, but thanks to a discovery from @drakenjin, and my install tips from the same thread, you should be able to fix these errors. If everything goes well, you should be able to install anything from Samsung’s app store, to the Gear 2 and phone, especially the free launcher that we need for everything to work. Example: Gear 2 -> Phone -> and back to Gear 2 again, with a notification! Go back to your task “Phone Battery Level”, you should see “1. Notify” with the title below it. This will clear the notification on the phone automatically after it appears. Useful in this case. Add an application icon (important!) using the button on the bottom right. Press the button on the top right -> Export -> As app. Wait for it to finish -> press the robot on the bottom right of the popup and install. In LaunchGear, press + and add your “Phone Battery Level” app and confirm. Run LaunchGear and then the app, to see your phone’s battery level on your watch! And these are pretty much the basics . Not to mention what other complex apps could be created! Have fun and thanks go to @CarbonWyre, @drakenjin, Heedeok Lee and other users from the guide mentioned above. OBSOLETE (use step 6 instead): Use Ns Auto Clear if you have tasker apps that create notifications which are useless on the phone but are useful on the gear! e.g. The "Phone Battery Level" app, from my example above, will generate notifications which are rather useless on the phone and should be automatically cleared. Ns Auto Clear does not disable them completely (like this the gear wouldn't receive them at all) but clears notifications from specified apps right after you get them on the phone. 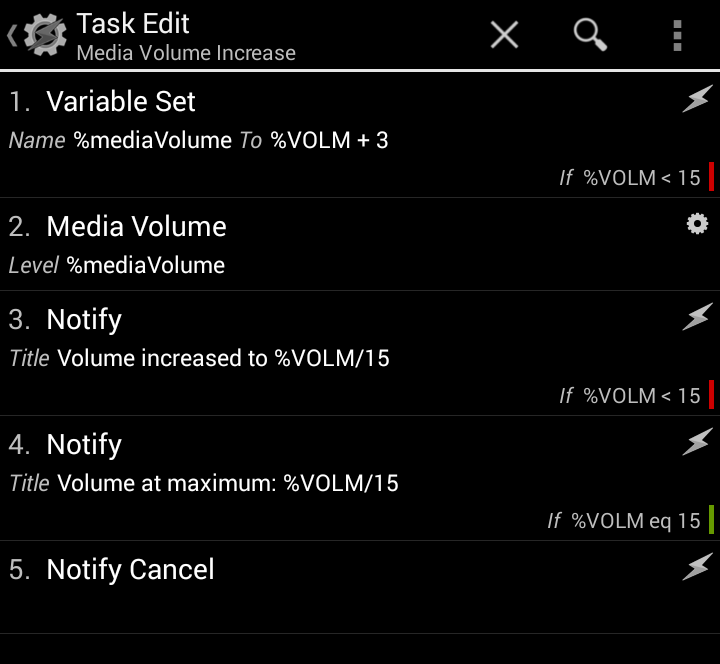 23.07.2014: Replaced Ns Auto Clear with a way to remove notifications with Tasker. See step 6. Thanks @stanguay. Surprised this hasn't got more attention, finding this really interesting. Do you have any tasks that you use to give me some inspiration? I now have ad hoc notifications for lots of bits but It appears tasker probably is alot more powerful. Probably because installing from the galaxy apps store was limited to stand-alone apps until now, on custom roms at least. Getting rid of the “Installation Failed. Try Later. (0)“ error is mandatory but the workaround does not work for everybody, yet, from what I see in the other thread. getting only notifications from tasker delivered to your gear, which works without LaunchGear and even with the “Installation Failed. Try Later. (0)“ error, as it's unrelated. getting your gear to control tasker, which is covered in the first post. Think of what you want your phone to run or automate, like: turning on your laptop (see first image) by using the wol plugin, or anything that can be sent to the gear, without having to always take the phone out or when it's charging. Right now I plan to connect tasker to unified remote. This will bring a lot more possibilities for controlling my network devices at home. Some tips will also be added to the first post. OMG been looking for tasker for Gear 2, I'm gonna have to try this when I get home. Saw tasker working for Android wear and got jealous now I can try it yes thank you, now I just have to root my S4. Does anybody have a link for samsung app store I have a S3 with custom rom want to test it out on that phone first before I try it out on mm daily phone ? For the samsung app store related issues, please see the: [Guide] How to set up Galaxy Gear 2 for non Samsung devices (Full Tutorial) , especially the first post and then page 53 and 54 because you will need that Samsung app store workaround from these pages to work in order to get the desired results of this tutorial. so with this I can basically use Tasker on my Gear 2 like on Android wear ? If Android wear still uses a smartphone for it's automations (and Tasker), then yes, it's the same. After you install Ns Auto Clear from the app store, run it and enable it for the desired application. L.E. please see step 6 in my first post. you can use tasker to remove the notifications automatically after they appear. After you install Ns Auto Clear from the app store, run it and enable it for the desired application, e.g. I'm still looking for a better app because this makes problems. Usually it starts hidding notifications that should not be hidden and then I always have to check the list, if anything changed again. First, make sure you were successful in getting Tasker to work with the Gear 2 (see first post). Yes, lots of steps but once you create 2-3 apps, everything will seem easier Now enjoy your new apps for controlling your phone with your Gear 2 while going for a run! 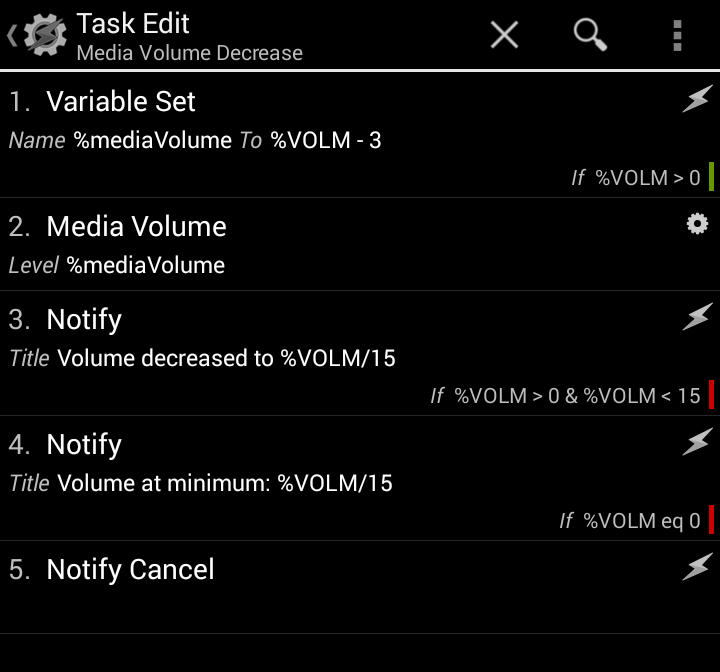 23.07.2014: Added a way to remove the generated notifications on the phone with Tasker (step 11 for the first two apps. step 8 for the last one), so they don't pile up. Thanks @stanguay.